Preheat oven to 425. While oven is heating, slice sunchokes into 1/4-inch medallions. On a foil-lined baking sheet, toss sunchokes with olive oil, salt & pepper. Once oven has heated, roast for 10 minutes, then toss, and roast another 5 minutes. Continue with next steps while sunchokes are roasting. Fill the bottom of a nonstick skillet with ½-inch of water. Slice lime, and add to water along with ginger and white part of scallion. Cover and bring to a boil over med-high heat. Meanwhile, slice green part of scallion and set aside. Pour sesame-honey dressing into the bottom of your salad bowl. Add brussels sprouts, season with salt & pepper, toss gently and set aside. After you toss sunchokes, add salmon to the skillet with boiling water, cover and reduce heat to simmer. Cook 5-7 minutes. Check for doneness and use a spatula to carefully lift salmon from skillet. When salmon is done, if sunchokes have not browned, turn on broiler and watch carefully until sunchokes are golden and crispy around edges. Add mixed greens to the bowl with shaved brussels sprouts and toss gently. Add additional olive oil and salt & pepper as needed. Top salmon with a sprinkle of green tea salt and sliced scallion. Serve salad and sunchokes on the side. 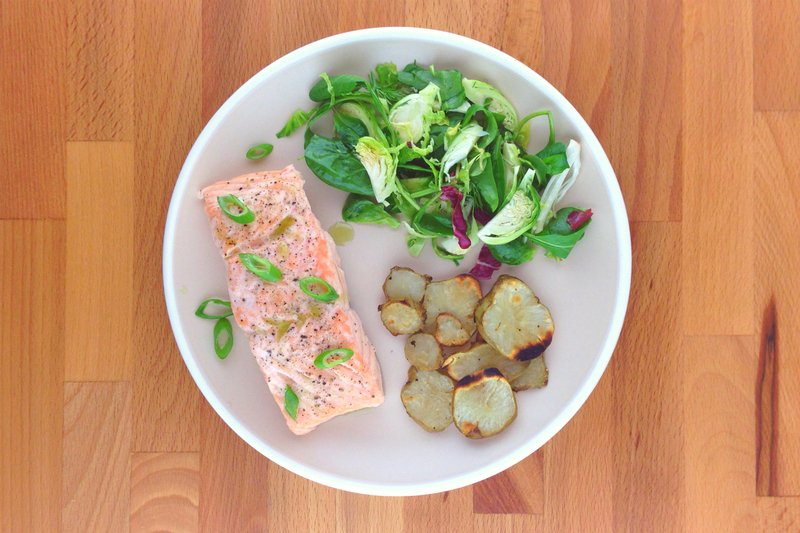 This entry was posted in Meal-Kit Recipes, Seafood on January 31, 2016 by Megan Rappe.